This is a slow cooker dish that brings out the bold flavor of short ribs. Serve over cream sweet potato puree with a hearty meal. Carefully, trim the meat from the bones and place the bones in a heat safe dish. Cook the bones in a microwave for 10 to 15 minutes, flipping once or twice, until browned. Meanwhile, pat the beef dry with a paper towel and heat a skillet over medium-high heat. Add the 1 tablespoon oil to the hot pan and swirl to coat. Place the beef in the skillet and brown on all sides. Place in the slow cooker. In the same pan, add the remaining oil. Saute the onion, carrot, and celery for 5 to 7 minutes, until soft. Stir in the garlic, tomato paste, and flour, cooking for a minute longer. Slowly whisk in the ale, scraping up any accumulated brown bits on the bottom of the pan. Whisk until slightly thickened and stir in the balsamic vinegar. Turn off the heat and allow the liquid to settle. Add the veggies and liquid to the slow cooker. Stir in the chicken broth, bay leaves, and thyme. Cover and cook on low for 9 to 10 hours. Skim the fat from the surface and discard. With a slotted spoon, remove the bones and beef from the cooking liquid. Pour the cooking liquid through a strainer into a clean pot. Cook at a gentle simmer over medium-low heat, until reduced by half. Meanwhile, make the sweet potato puree. Boil the diced sweet potatoes for 7 to 10 minutes in a large pot of salted water. Drain when fork tender. Whip the sweet potatoes with butter and cream until smooth and fluffy. Season with salt and pepper as desired. 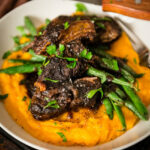 Serve sweet potatoes with hot short ribs and reduction sauce. To make Whole30 Compliant, omit the flour and use arrowroot powder for thickener. Replace the stout with bone broth instead. Add a dash or two of coconut aminos to bump the flavor.